Mold becomes a problem inside a home or business when there’s excessive humidity or moisture for an extended period of time. The problem can originate from sudden water releases, like a burst pipe or large spill that goes untreated, or from a chronic condition, such as a leaking roof or plumbing. Even high humidity or warm, moist air condensing on cool surfaces can trigger mold problems. It’s always best to have the mold evaluated and removed by a certified professional like Water Pro, Inc.
Certified professionals at Water Pro Inc. have the training and experience to: identify moisture sources, evaluate mold growth (visible or suspected), to contain damage to the smallest area possible, to physically remove contamination, to dry materials to ensure that mold will not return, and to perform or recommend procedures for returning property to a pre-loss condition. 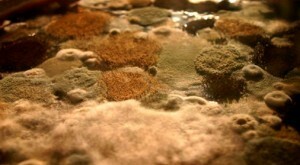 Mold can grow almost anywhere in a home or business if conditions permit. If there is visible growth on painted wall surfaces, property owners should be concerned about what may be growing on the wall’s opposite side. The environment inside the walls of a house often differs drastically from the outside and could create a perfect haven for mold. If the wall remains wet for a prolonged period, it’s almost guaranteed that the mold growth on the backside will be worse than on the front. At that point, containing the workspace and removing moldy materials, followed by cleaning of salvageable framing, are the best options. Reduce indoor humidity (to 30-60% ) to decrease mold growth by: venting bathrooms, dryers, and other moisture-generating sources to the outside; using air conditioners and dehumidifiers; increasing ventilation; and using exhaust fans whenever cooking, dishwashing, and cleaning. Molds can trigger asthma episodes in sensitive individuals with asthma. People with asthma should avoid contact with or exposure to molds. One third to one half of all structures have damp conditions that may encourage development of pollutants such as molds and bacteria, which can cause allergic reactions — including asthma — and spread infectious diseases. The only way to get rid of the mold, is to completely dry the building. It is essential to remember that damage resulting from water is progressive. The longer the water flows or wet conditions exist, the more is absorbed and the greater is the recovery problem. Merely stopping the source of the incoming water does not stop further water damage, though it is an obvious and critical first step. 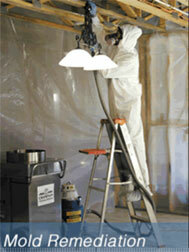 Servicing your mold damage, mold remediation and mold removal needs in the Metro areas. We use licensed subcontractors when necessary. For immediate mold removal and help with mold remediation damage, call (404) 822-8632!